An 80-Year-Old Looks Into The Eyes Of Her Teenage Self : Goats and Soda In 1950, a teenage girl in Nigeria put on her mother's fancy clothes and posed for a photo. In 2015, she had her first encounter with the original, hand-colored portrait. 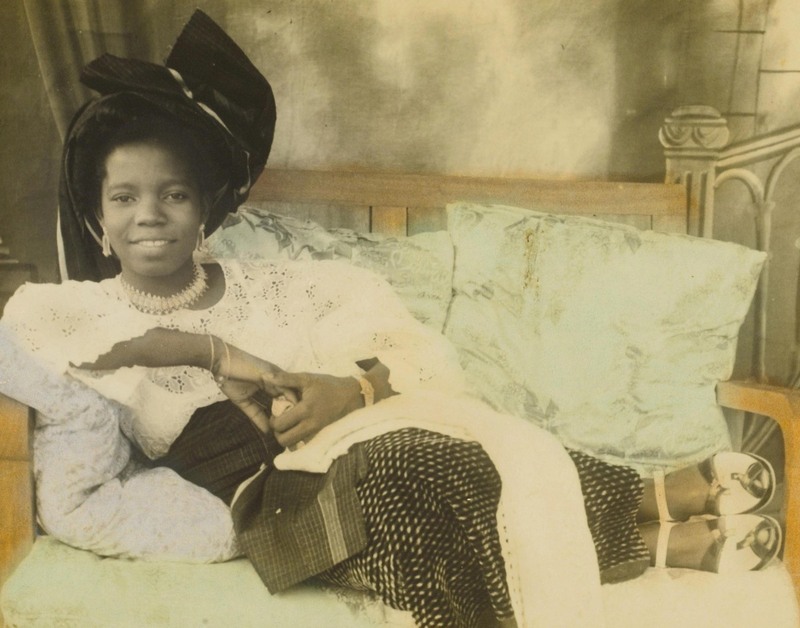 The hand-colored photo, titled "Reclining young lady," is of Stella Osarhiere Gbinigie when she was 16. She dressed up in her mother's lace blouse and wore her jewels. She and her two sisters were going to get her picture taken at a studio in Benin, Nigeria. She struck a pose. The year was 1950 and she was 16 years old. Stella Osarhiere Gbinigie, 80, visited the Smithsonian's National Museum of African Art in Washington, D.C., this week. Flash forward 65 years. Stella Osarhiere Gbinigie is in Washington, D.C., this month. She is now 80. And she comes face-to-face with her youthful portrait, hanging on the walls of the Smithsonian's National Museum of African Art. She had never seen the original hand-colored portrait until just this past Tuesday. She stood quietly for quite a while in front of the photograph. "He was a true gentleman," she said of the photographer, Solomon Osagie Alonge. "He was always calm. He treated us like his own children, not a client." There is, of course, a story behind the museum moment. Curator Amy Staples visited Lagos, Nigeria, in December 2012 seeking funding for an exhibition of Alonge's work. At a reception, she was introduced to a potential funder named Godwin Obaseki. Staples showed some of the photos that would be included in the exhibit. Obaseki was flipping through the portfolio when he stopped at the picture of 16-year-old Stella Osarhiere Gbinigie and exclaimed, "Well, that's my mother." He wasn't totally surprised. He'd heard from his nephew that an old photo of his mother was circulating on the Internet. Now he was staring at a copy of that exact rumored photo. The online photo, says Staples, was part of a presentation she gave at the Smithsonian Archives Fair in 2010. Obaseki called his mother at once. She came to Staples' hotel the next day and confirmed that the youthful person in the photo was indeed her. "I was surprised when my son showed it to me and said, 'Mommy is this you?' " she says. "I said, 'Of course this is me. Where did you get the photograph?' "
On a visit to the U.S. to see family and friends this week, Gbinigie made a pilgrimage to the gallery, where she spoke with Staples. "Did you know he [Alonge] only hand-colored his favorite portraits?" Staples asked. "It was his idea to do something to the photograph to make it look better," Gbinigie said with a chuckle. "I'm very happy that his work is now recognized by other people that are not Nigerians," she added. "Anybody who knew him would be happy." And many people knew of the photographer. Alonge became interested in photography at age 14. After an apprenticeship he moved from Lagos to Benin to open his own studio. He went on to become the official photographer of the royal court, documenting the kings and their wives and children as well as visiting dignitaries and court ceremonies. The exhibit at the museum, "Chief S.O. Alonge: Photographer to the Royal Courts of Benin," includes other portraits as well, including the image of Gbinigie. In his studio, he'd set up the props and suggest poses for his subjects. Gbinigie went on to study abroad, attending the Palantine Secretarial College in Osborn, United Kingdom. After college, she worked as a secretary at the Office of the Federal Government in Lagos for 32 years before retiring in 1994, the year Alonge died. 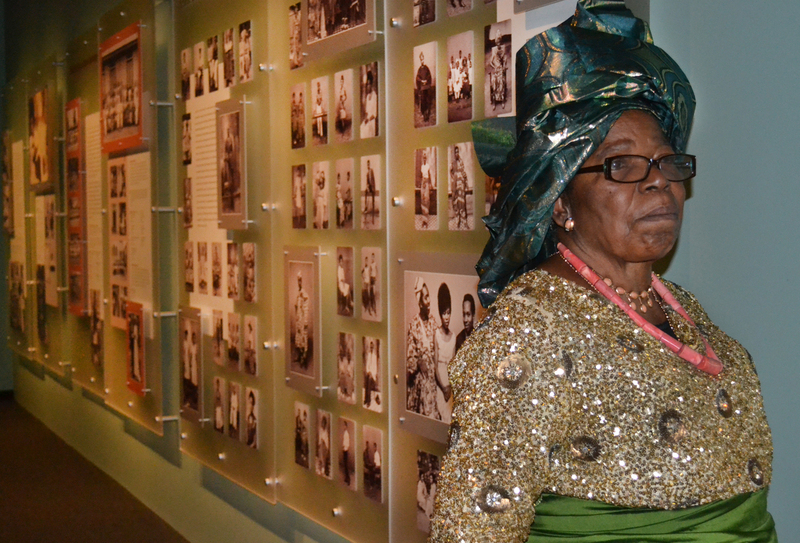 The exhibit is on display at the museum until Sept. 13; the plan is to bring it to Benin in 2016.